A thug threw a dog against a wall and strangled it to death after becoming angry when it got under his feet. Robert Fitzgerald, 38, killed the tiny Yorkshire terrier called Titch after he flew into a rage when he tripped over it. He had been looking after Titch for friends Paul and Donna James at their home in Birmingham while they went on holiday to Spain. But a court heard the 38-year-old became stressed following an angry phone call with his employers on April 21 this year and viciously attacked the defenceless animal. A neighbour, Jade Leech, who had been asked to keep an eye on the dog by its owners, found the dead pet wrapped in bedding the day after the attack. West Midlands Police and the Royal Society for the Prevention of Cruelty to Animals (RSPCA) were called in to investigate. A post mortem found Titch died of blunt force trauma to the head, causing a brain haemorrhage and fracture to the skull on the left side of the head behind the eye. The vet also found dislocation of the tail bones 2.5cm away from the tip of the tail. In a police interview, Fitzgerald, of Sparkhill, Birmingham, who has learning difficulties, admitted killing the animal. He was jailed earlier this week for 16 weeks after pleading guilty to causing unnecessary suffering to a protected animal at Birmingham Magistrates Court. Chair of the bench Paul Grace also disqualified him from owning animals for life and ordered Fitzgerald to pay a victim surcharge of £115. He said: ‘The offence is so serious only a custodial sentence can be justified. We find high culpability and greater harm. ‘Your learning difficulties do not mitigate your behaviour. We sentence you to 20 weeks reduced to 16 weeks because of your early guilty plea. ‘We disqualify you for life from owning another animal. 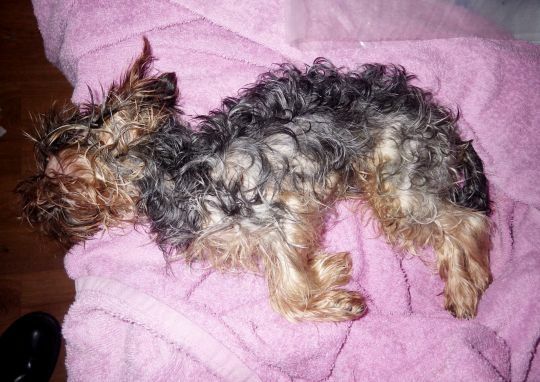 This was an appalling incident – you are going down now.’ Rafe Turner, prosecuting on behalf of the RSPCA, said: ‘He has admitted causing the dog’s death. ‘Perhaps the clue to the size of the dog is in the name – Titch. The dog was owned by Mr and Mrs James who had gone on holiday to Spain. ‘Mr Fitzgerald had been given a spare room in the premises. ‘Ms Leech found the dog wrapped in bedding. The police and the RSPCA were notified. The lady said she hadn’t seen the dog since the night before.